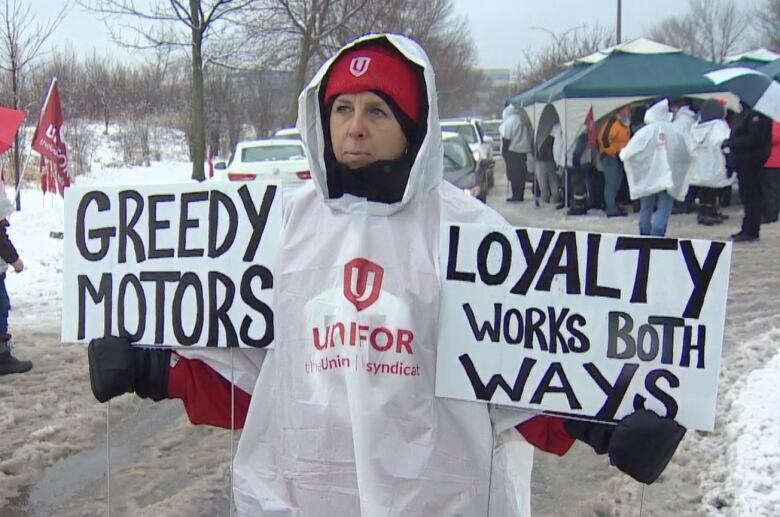 Unionized workers are protesting outside the entrances to General Motors headquarters in Oshawa Wednesday to show opposition to the planned closure of the plant. 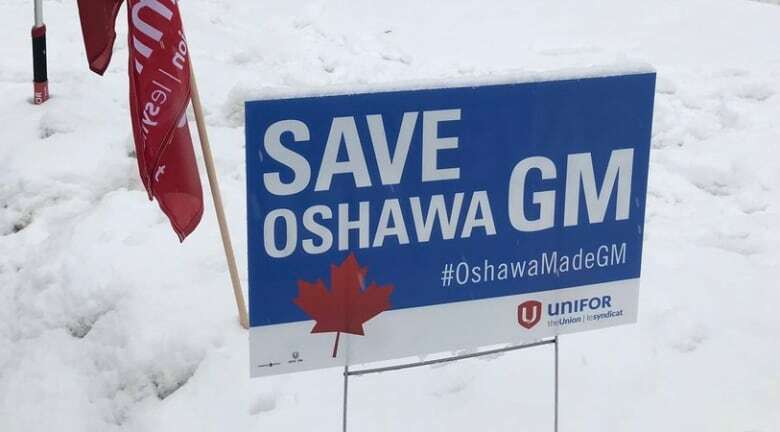 Protests by workers against General Motors will continue in Ontario until the company reverses its decision to close a plant in Oshawa later this year, Unifor national president Jerry Dias says. Speaking to dozens of employees outside GM headquarters in Oshawa, Dias said he is not calling for an "outright boycott" of GM vehicles, but said Unifor members are angry at the impending closure of the Oshawa Assembly Plant slated for the end of 2019. "We are not going to stop until you reverse this outrageous decision. You can't do to this our members, our community, our country," he told the crowd in the rain on Wednesday. Dias said workers are also upset that GM is refusing to honour a collective agreement, signed in 2016, that was to cover a period until September 2020. According to the union, the agreement stipulated that there would be no closure of the plant while the agreement was in effect. Dias addressed workers outside entrances to GM headquarters at a protest that began early Wednesday. Workers blocked road access into the facility and placed signs and placards in the snow. The protest is expected to continue into the evening. He acknowledged that GM had claimed the protest was illegal, but he said what the company has done is illegal because it accepted $11 billion in financial aid from the federal and Ontario governments, then decided to close the plant. "Based on General Motors' commitment in 2016, our young members went out and bought homes, bought new cars, started families. People made decisions based on General Motors' commitment. And General Motors does not have the right to go against the written word," he said. "If we want to talk about what's illegal, we should also talk about what's immoral." Dias said GM, which he accused of lying, will be known as "Greedy Motors" until it decides to keep the the plant open. GM has steadfastly refused to reconsider its decision to close the plant. Earlier, Colin James, president of Unifor Local 222, which represents workers at the plant, said the union staged the protest in an attempt to get the company's attention. "We plan on staying here as long as it takes. We are trying to send a clear message to GM that the decision that they have made they cannot justify. It's an award-winning plant," he said. "I believe today we will get some attention. We're increasing awareness that here's a company that's making record profits. And now they're turning their back on Canadians." James said workers have been preventing vehicles from entering its headquarters, but the protest has been legal. The union has set up fire barrels and canopies to keep workers at the protest warm. Many protesters are also wearing rain coats. James said the union has received letters, phone calls and email messages of support from hundreds of Canadians. "Canadians are sending a message that: 'If you want to sell here, you need to build here.'" Jenn Cowie, a line worker at GM in Oshawa for 16 years, said she attended the protest because she feels betrayed by the company. "We are getting out the message that we are not going away. People understand that this is all due to corporate greed," she said. "I don't know what my next steps are, but as far as right now, we are sticking together. These are good paying jobs that are in our community. We've earned our jobs here." As for the plant, located a distance away, it was running on Wednesday and the union said it asked its members to continue to work. 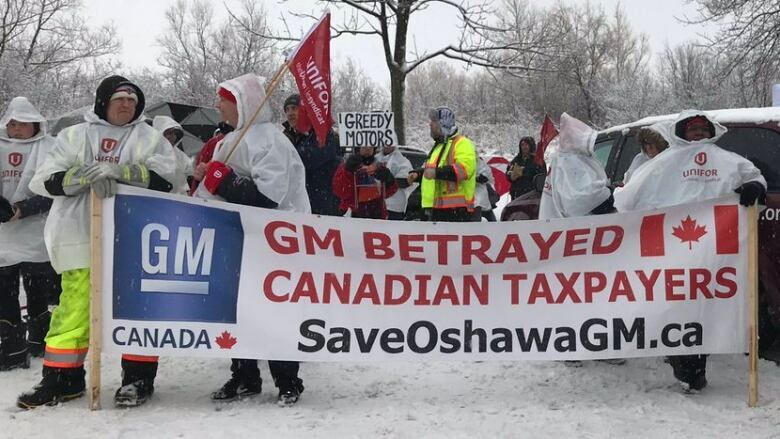 For its part, GM Canada said in a tweet that it considers the protest illegal and it does not condone blocking of road access, which it said affects third parties. It added that the protest is not affecting work because the company has alternate plans. Unifor blockade of road access in Oshawa today. Illegal actions like these affect third parties and cannot be condoned. GM’s work will not be affected today as we are prepared with alternate plans. GM has rejected all union proposals to keep the plant open past 2019. The plant, about 60 kilometres east of Toronto, employs more than 2,500 hourly workers. The company announced in November that work at the plant would end by December 2019, a decision that Unifor has challenged.